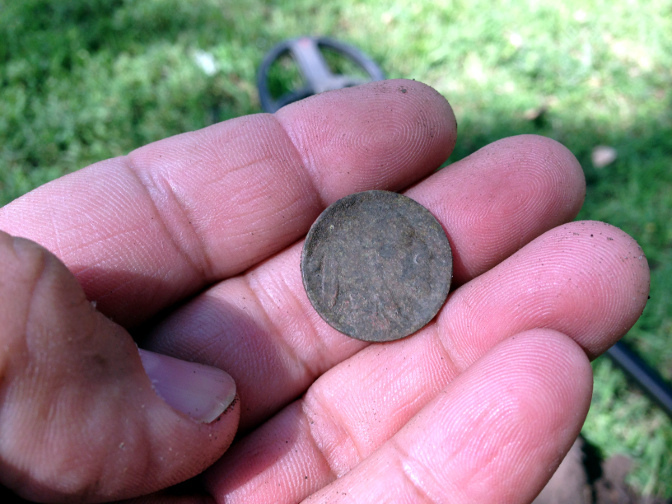 I hunted for a short time today at the site where I’ve been finding old coins. I’m still perfecting the Money Making Protocol (MMP) with the trusty XP Deus. 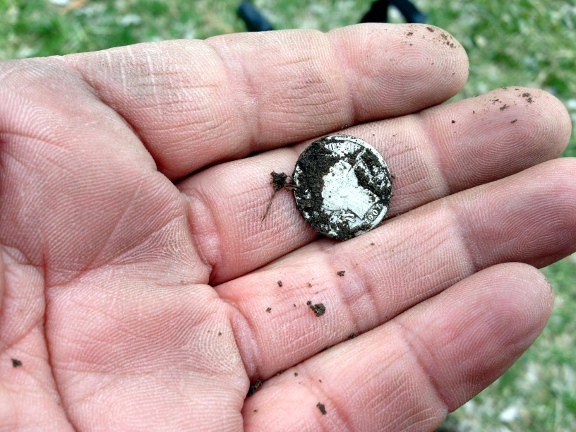 So, if you don’t know already, I believe there are still thousands of silver coins in our city parks but they are either too deep or masked. The MMP is designed to find me the former and it didn’t disappoint this morning. Yep, this puppy was down about 10 inches. Now, there is only moderate wear on it so I think it was dropped near the date of minting. I am very excited for the possibilities. I know there are more Seated coins in that park and I aim to get me at least one. The rusted object in the middle is actually a really cool pin from some kind of farmer’s fair. I haven’t yet cleaned it enough to take a picture of it. 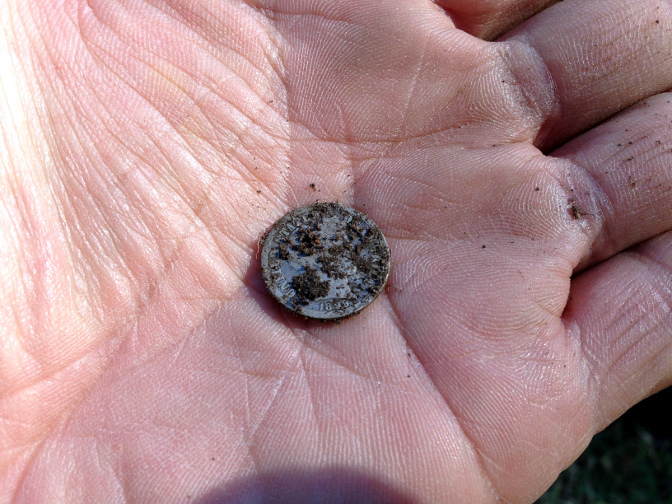 Right below it, there is a wheat cent that appears to have been buffed until all detail was gone. The third hunt with the new coil happened at a site that has long since stopped producing. That is exactly the reason why I chose the spot. 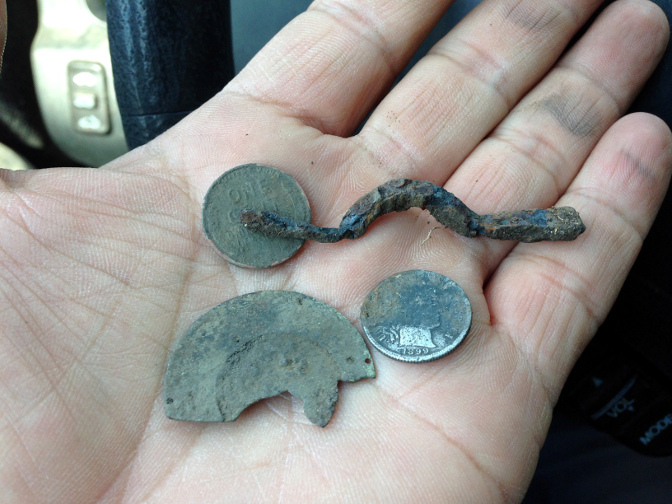 Again, I spent maybe 30 minutes there and I found a 1919 wheat cent and a 1902 Barber dime. Although the ring in the picture has no corrosion, I don’t think it’s real gold. I sure hope this is a sign of things to come. I have many old sites that I will revisit with the new coil. Stay tuned. I took Maurice down to Riverside park again today at lunch. I decided to return to an area that appears was a pond at one time. The earliest aerial photo I can find, from 1938, shows that the pond was already dry by then. Anyway, I’ve found a few old coins along the erstwhile bank so I thought I would try again. Not too long into the hunt, I got a deep squeak and I decided it was worth digging. Around the eight inch mark I pulled this, my fiftieth silver coin of the year. 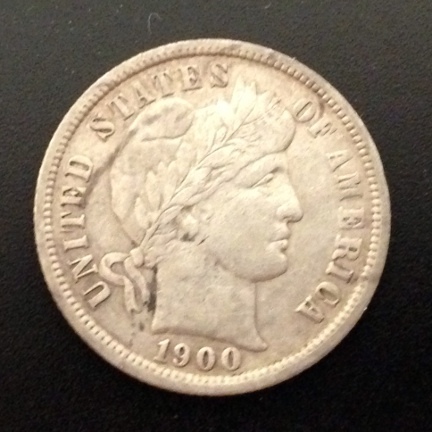 It’s another 1899 Barber dime with no mint mark (which means it was minted in Philadelphia). 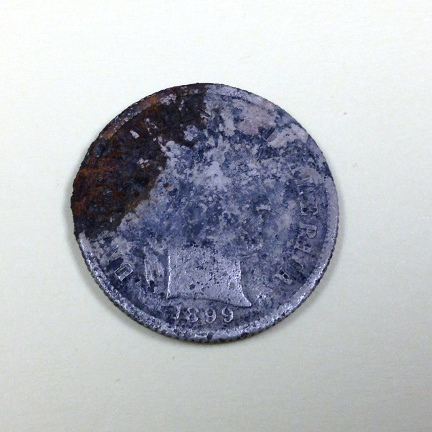 Two things to note here: The coin was laying against rusted iron and the coin was at one time, exposed to water for a considerable time. I thus deduce that this coin was dropped when there was water in the pond. Brilliant, I know. Before I covered the hole, I scanned it with the pinpointer and I got another hit! 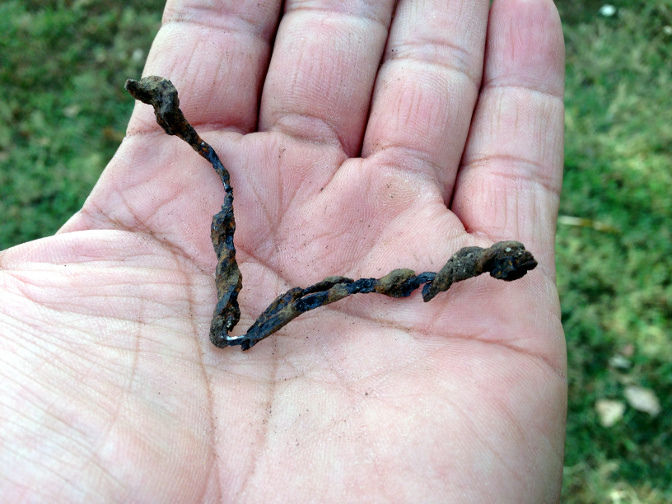 Unfortunately, it was a piece of ancient barbed wire (I think) and possibly the piece of rusted iron the dime rested next to. The half round object near gave me a stroke. 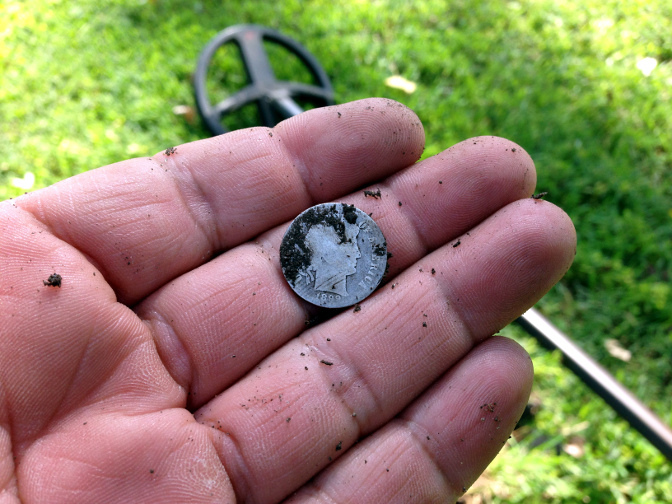 It was at the bottom of a 9 inch deep hole and I thought for sure I had a large cent! Alas, it is a piece of a very old pocket watch. It is decorated (it is cool how long ago we even decorated pieces that were not meant to be seen) and the holes and pits you see is where this piece fit with the other parts of the watch. 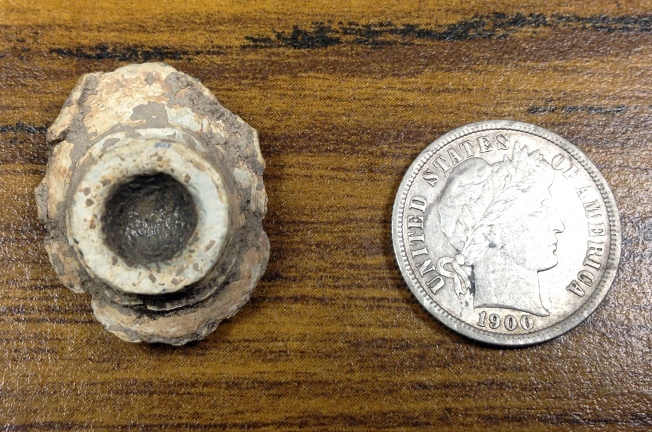 The wheat cent is a 1944 and the square nail is the millionth square nail I have found in our city parks. I will never know for sure why there are soooo many square nails in our city parks. Now, I only need to find another 50 silver coins between today and New Year’s to meet my goal of 100 silver coins for the year. I decided to take Maurice to the oldest park in the city for lunch today. I know there is a Seated coin in that park and I aim to find it. For today however, I must be content with my 6th Barber dime of the year. 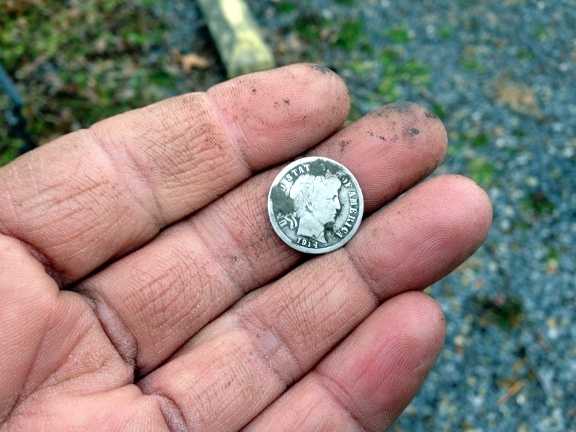 This dime was barely two inches under the ground, surrounded by trash and iron. Among a cacophony of mid tones and iron signals there was a high, sweet sound, just barely discernible. 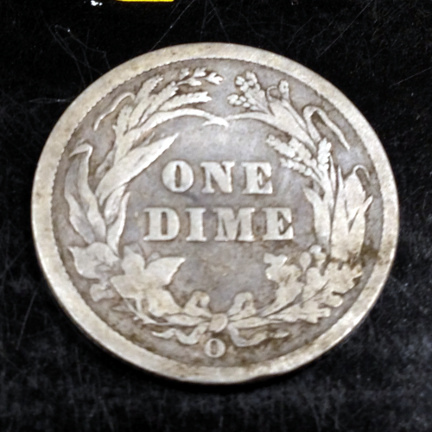 Alas, my trusty XP Deus never lies (although I often misunderstand it) and out of the ground came this 1899 O Barber dime. When I first looked at it at the park, I thought it was a D mint mark. Once I returned to my office and ran some water over it, I could see the slightly misshapen O. I love it! This is my first New Orleans mint mark ever. The mint at New Orleans was active for only a short time and now I got a coin from there. 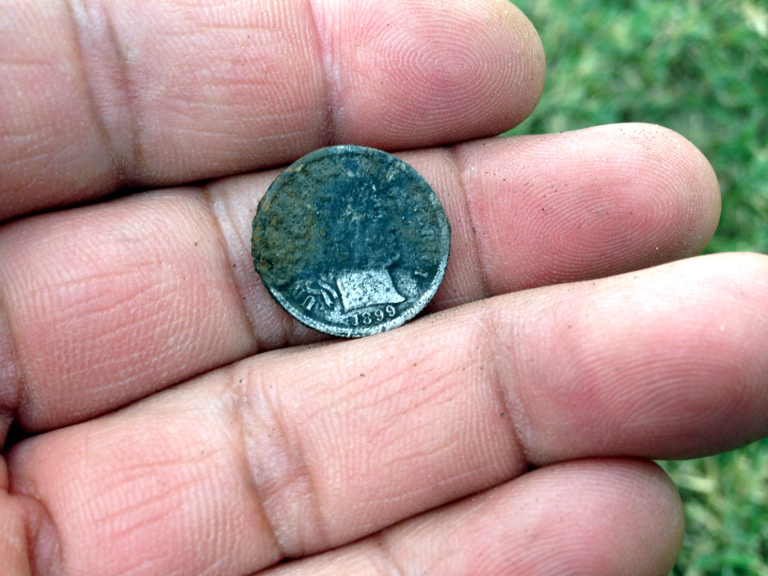 This is my third silver coin from this park. It is a difficult park but it is loaded with goodies. 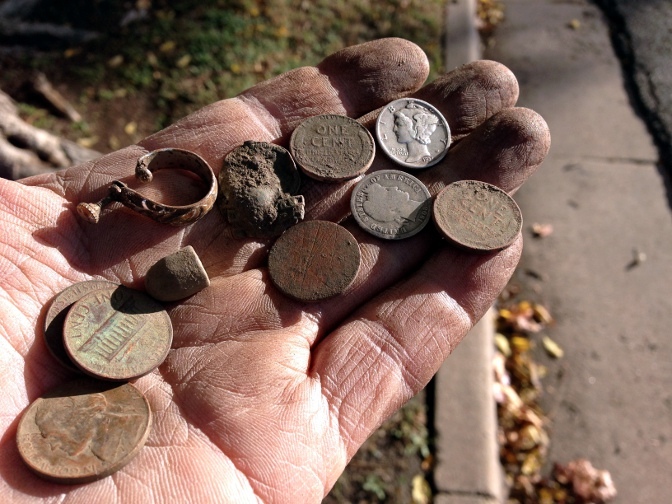 Besides the silver coins, I’ve found a heavy gold bracelet here plus a number of old nickels including Buffaloes and V’s plus a couple of Indian Head cents. Oh yeah, and a bullet from the 1850’s. It won’t be long now, before this park gives up its Seated coin to me. P.S. I forgot to mention that my good friends have a new nickname for me: AlmostASeated. I must say I’ve earned it. LOL! The first was a 1919 Buffalo nickel. The Buffs I find usually don’t have a visible date but this one does so I will post about it. Because of the all iron nails at this park (don’t know why there are so many), this nickel came up as a square pull tab. The signal was sweet however and I opted to see what it was. 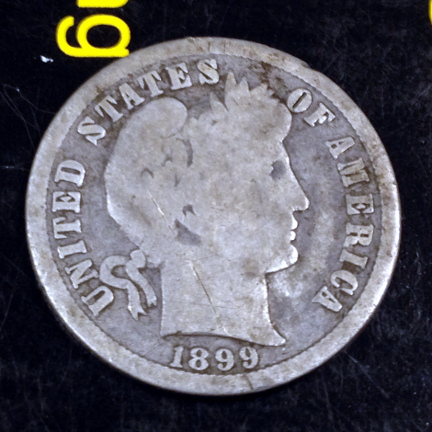 The second coin was a well worn 1899 Barber dime. This guy was mixed in with some aluminum foil so the signal was a warble of mid and high tones. Again, the sweetness of the high tones made me dig it. I think this small park has many, many more coins and I aim to dig them all up. Wish me luck. I was taking the picture of the dirty coin when Stevo arrived. He was just in time to see the coin with the fresh dirt on it. When I find a coin with very little wear as this one, I infer that it was dropped soon after it was minted. So someone lost this precious in the early years of the 20th century. How cool is that? Soon after, I dug a signal on the wheat range and I found an old bullet. Now, about 100 yards away from where we were hunting, there is a row of houses. I know for a fact that one of those houses was built in 1901. Would someone be firing their rifle so close to these houses? I’d like to think not and I’d like to think this bullet is pre 1900’s. It looks as if the bullet hit the Buffalo. My lunch hour went much quicker than I like and I left Stevo hunting in the park. I hunted my deep silver park the other day and found a bunch of wheats as always and these two things. 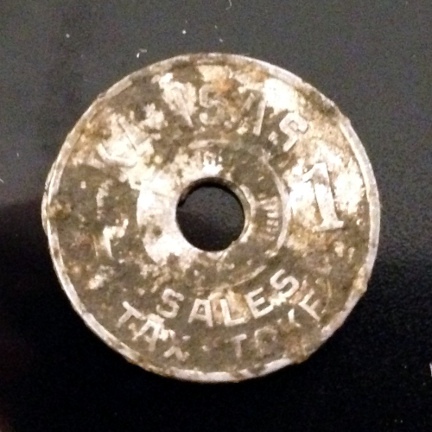 I remember the first time I found a Kansas tax token. I was so intrigued by it. Now, they don’t excite me as much although they are an old and cool find. This one is one mil. Rarer for me are the 2 mil ones. They are made of aluminum and they never come up in good shape. 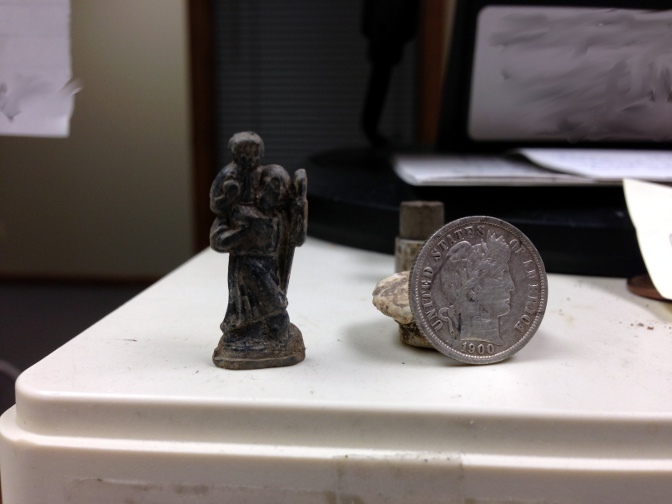 A tiny lead Saint Christopher. The fact that it is made of lead and the fact that it was over 8 inches deep tells me it is an old relic. The mystery to me is that it doesn’t appear to be part of a pendant but rather it seems to be a tiny statue. As you can see, it has a flat base that allows it to stand. There are remnants of the black paint that covered it at one time and the word GERMANY is stamped on the base. The Barber is used for size comparison. Interesting. I am taking a trip this Saturday to the Eastern Kansas border for a Karate tournament. I hope to have an hour or so to hunt an old park I know about. I am going back to the 1840’s and 1850’s time-wise and maybe, just maybe, I may be able to find a Seated coin. After work I stopped at my old trashy park to do some hunting. While there, I got a text from my friend Stevouke telling me that today he was going to catch up with me on the silver coin count. He has 11 silver coins for the year with his trusty Ace 250 whilst I had 12. I told him he may well catch up but that I wasn’t gonna make it easy for him. This is silver coin number 13 for the year. 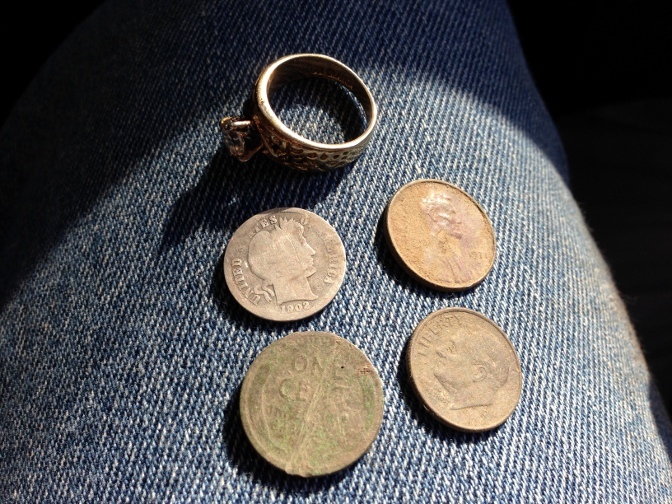 Later I found a few more interesting things including a 1919 wheat cent. 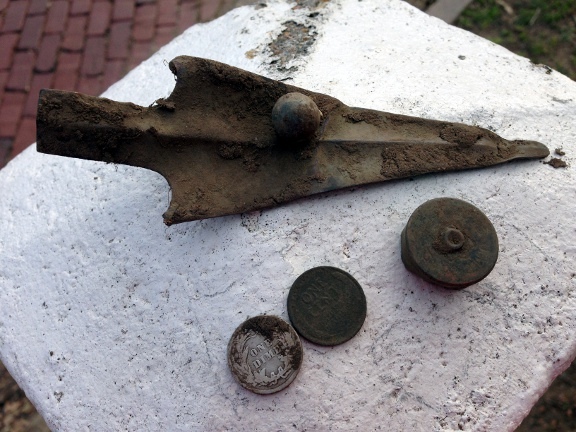 I haven’t found a shot shell in a while and the arrow head looking thing appears to be a tip from a fence maybe. So it was an enjoyable afternoon and I am back to silver after a whole month of not hunting much. On my way to the car I saw this bit of graffiti. 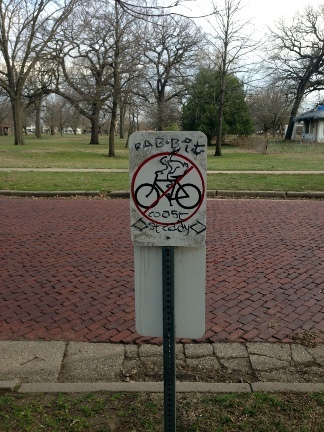 Normally I disapprove of graffiti but this was too clever to pass up. Here’s to finding more silver in April! Maurice and I hunted with Stevouke today. I started with clad and wheats as it is my fashion nowadays. Eventually, I hit a faint, deep signal and I went for it. At about 8 inches deep I pulled a dirt clump with a pretty silver edge poking through. In my excitement I forgot to take a picture of the dirt ball with the coin in it. It’s such an awesome sight! 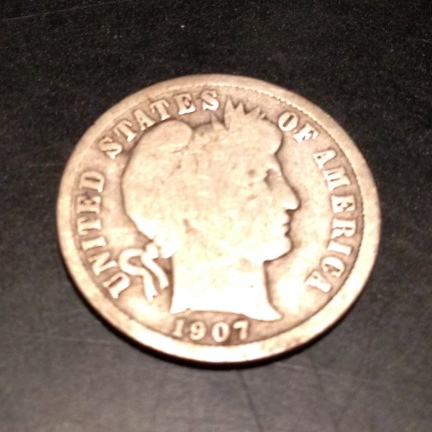 The 1914 Barber dime has no mint mark which means it was minted in Philadelphia. No other silver was to be had though I had a great time with Stevouke as always.